The Capes of Achievement are special capes rewarded to players who have achieved level 99 in a skill or completed all quests in the game. These capes are for members only. For many years, players complained about how achieving 99 in a skill meant nothing, and it wasn't appreciated with a special reward. Some players felt the same way with completing every quest. 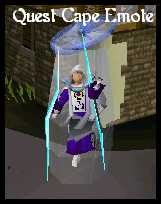 On October 18, 2006, JaGeX finally released special capes for those with level 99 in a skill or completion of all quests. They even come with a matching hood. All around Runescape are special NPC's who are considered the masters of each skill. These masters will sell you a cape and hood for the price of 99,000gp. You can only buy a cape with a level 99 skill, and you can only buy the cape of your 99 level from the master of that skill. Below is a list of who sells the cape and where you can find them. Agility Cap'n Izzy No-Beard Found at the entrance to the Agility Arena, located in Brimhaven. Attack Ajjat Inside the Warriors' Guild, located in Burthorpe. Constitution Surgeon General Tafini Found in the Duel Arena hospital, located north of the Duel Arena. Construction Estate Agent Found around Runescape in Estate Houses, such as Varrock or Falador. Cooking Head Chef Found in the Cooks' Guild, located west of Varrock. Crafting Master Crafter Found in the Crafting Guild, located north of Rimmington. Defence Melee Guide Found with the other combat tutors in Lumbridge. Dungeoneering Thok South of the castle of Daemonheim. Farming Martin the Master Gardener Found in Draynor Village. Firemaking Ignatius Vulcan Found wandering in a forest, located south of Seers' Village. Fishing Master Fisher Found outside the Fishing Guild, located in Hemenster. Fletching Hickton Found in the archery shop, located in Catherby. Herblore Kaqemeex Found at the Altar of Guthix, located in Taverley. Hunter Hunter Expert Found in a small hut, south of the Feldip Hills. Magic Robe Store Owner Found on the middle level of the Magic Guild, located in Yanille. Mining Dwarf Found at the ladders to the Mining Guild, located south of the east bank of Falador. Prayer Brother Jered Found on the top level of the Monastery, north of Barbarian Village. Ranging Armour Salesman Found in the Ranging Guild, located in Hemenster. Runecrafting Aubury Found in the Rune Shop, located in Varrock. Slayer Duradel Found in Shilo Village, located in southern Karamja. Smithing Thurgo Found south of Port Sarim in a small hut. Strength Sloane Found on the second floor of the Warriors' Guild. Thieving Martin Thwait Found in the Rogues' Den, located downstairs of the Pub in Burthorpe. Woodcutting Woodsman Tutor Found found north of Falador. Quest Points Wise Old Man Found in his house, located in Draynor Village. As soon as a player reaches level 99 in two skills, his or her first achievement skill cape becomes trimmed immediately. Additionally, he or she will only be able to buy trimmed capes. 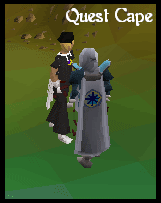 Trimmed capes look exactly like regular capes, only they have a colored, trimmed edging. Quest capes cannot be bought trimmed, and you cannot get a trimmed Skill Cape if you have one level-99 Skill and a quest cape. Hoods cannot be trimmed. The trimmed capes can be bought from the same people for the same price. You cannot own two skill capes and have one untrimmed. The instant you buy a second cape, they are both transferred into trimmed capes. Each cape has an "Operate" option while wearing it. Using this "Operate" option will increase the 99 skill to level 100. However, you can only active the "Operate" option for Constitution and Prayer once every minute. Along with the skill increased, the capes also benefit your stats. Each cape gives +9 bonus to all Defence stats. Trimmed capes give the same Defence stats and an additional +4 bonus to prayer. Hoods do not give any bonus. As mentioned before, each cape comes with it's own special emote. Each emote is longer and more animated than the regular emotes, such as "dance" or "joy jump". You cannot perform any of the emotes without wearing a skill cape. To perform the emote, click on the emote tab and select the emote with a ranger at the bottom of the list. What you just saw above is the cooking emote. As you can see, it is more animated and detailed than the regular emotes. Since we can't show you every emote, below is a list of descriptions of what your character will do during each emote. Attack Emote: Your character will punch the air, and force waves form from your hands. Next, your character will jump into the air from the ground and punches the air. Strength Emote: A heavyweight barbell will fall from the sky and land in front of your character. He will pick it up and raise it above his head with little difficulty, throw it to the ground and show his muscles. Defence Emote: Your character will pull out two shields, a small one in the right hand and a large one in the left hand. Arrows will shoot at your character and your character will block them with the large shield. Next, your character will block some more arrows with the smaller shield. Then, a rock will fall from the sky, and your character will lift the large shield above his head and block the rock from crushing you. Ranging Emote: Your Character pulls out a bow and shoots a flaming arrow into the air. Your character looks up at the arrow. The arrow falls where he is standing and jumps back to avoid it. Prayer Emote: A light appears from above, illuminating your character as he bends down, sprouting wings, looking like an angel. Your character flaps his wings once and hovers for a while, then flaps them and lands on his feet. Magic Emote: Your character rises up off of the ground in a hail of yellow magical power, spins around once, and lands. Runecrafting Emote: Your character bends down and draws lightning up from the ground in a circle around him, with lightning coming out of his hands. Four Runes (Air, Nature, Water and Fire) spin around him as the lightning rises out of the ground and the runes fade into him. Constitution Emote: Your character is struck by an arrow as his clothes disappear. He is then struck by another arrow as his skin disappears. Next, he is struck with the third arrow as his muscle disappear, leaving your character as a skeleton. He returns to normal, pulls all three arrows out of his body, and throws them away. Agility Emote: Your character jumps in the air, and a wooden pole rises up underneath them. After landing with one foot on that pole, another grows out of the ground behind him and he jumps backwards onto it, and then another grows out of the ground and he jumps backwards onto that one, immediately grabbing it with his hands and sliding down it. Herblore Emote: Your character takes out a vial of water, adds an herb from his belt, then a secondary ingredient. He then spins around and the potion starts to sparkle. Thieving Emote: A sack appears on your character's back and he drops into a crouched stance, glancing around to make sure no one catches him with the goods. Crafting Emote: Your character bends down and starts chiseling away at a block of wood. He spins around it, adding the final additions. He then holds it up in the air - it's a wooden toy. Fletching Emote: Your character will pull out a thin and long log. Then, he will take a knife and start cutting it into the shape of a bow, bend it into an arc, and string with a bowstring. Slayer Emote: A small Turoth will attack your character from behind. He will grab it, toss it into the air, and jump on it once it falls to the ground. Construction Emote: Your character takes a hammer and builds a wall on one side, then on another to another side and another until he builds a small house around him. Mining Emote: A rock will appear in front of your character. He will pull out a large pickaxe and swing at the rock with such force that the rock explodes into pieces. Smithing Emote: An anvil with a bar on it will appear in front of your character. He will take a hammer and smith a short sword. Next, he will put the short sword down and smith a battleaxe. Finally, he will put the battleaxe down and smith a longsword. Fishing Emote: A small pond with a fishing spot will appear in front of your character. He will take a large spear and catch a fish from the pond. He will hold the fish up, and then toss it over his shoulder. Cooking Emote: Your character will pull out a frying pan. He will flip the crust of a pie into the air. Next, he will flip the meat of the pie high into the air. Finally, your character will hold the pan out catching the meat, and then hold the finished meat pie above his head. Firemaking Emote: Your character will create a fireball in his left hand. He will wave it around with the same hand then move it to the right hand. Once in the right hand, the fire goes out. Woodcutting Emote: A large tree with a bird's nest on top will grow in front of your character. He will take a large axe and chop the tree down with four powerful swings. Once he chops the final part, the bird's nest will fall onto the stump, and the blue bird will fly into the air. Your character will lift his axe back and the bird will land on the edge of the axe. Farming Emote: Your character will pull out a watering can. He will water the ground in front of him, and then look into the sky for a second. He will look back down to notice flowers growing and blooming. He will pick one up and sniff it. Hunting Emote: A small kebbit will walk in front of your character. He will set up a pole with a cage attached to the top, and drop the cage on top of the kebbit. Your character will grab the kebbit and pull it out of the cage, and then hold it high with his right hand. Quest Point Emote: A large 3D quest symbol will appear over your character's head. It will shoot lighting to the ground. Your character will try to dodge the lighting, but he will be lifted into the air and will spin around gracefully, then drop to the ground. Summoning Emote: Your character will look up, reaching their arms into the air. A glowing ball with stars flashing around it will appear and a number of Summoning familiars including a Spirit Wolf, a bug with big eyes, a Barker Toad, a Hydra and a Unicorn Stallion, each one spinning within the glowing ball.